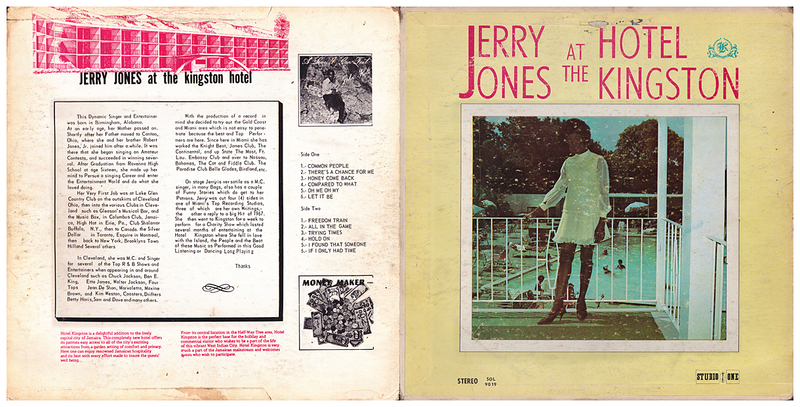 Jerry Jones is an American singer who was originally engaged to perform at the Kingston Hotel for one week, but fell in love with Jamaica and eventually stayed for several months. Coxsone Dodd saw her perform at the hotel and invited her to record for him at Studio One. This is an excellent collection of soulful standards recorded in the studio with a reggae backing by the Sound Dimension, and includes an awesome version of Compared To What, as well as a duet with Winston Francis on All In The Game. UK issue on the Bamboo label with stamped matrix. Unlike the Jamaican original, this issue is presented in split stereo, with the right channel favouring the vocal. The distinctive sleeve was designed by Horace Ove. 1990s reissue in conventional stereo with a new title (although the label still says AT THE KINGSTON HOTEL) and a new sleeve designed by O'Neil Nanco.